The Rufous-breasted Wren (Thryothorus rutilus) is a small songbird of Wren family. It is found in the tropical New World from Costa Rica and Panama east to Colombia, Venezuela, Trinidad and Tobago. Adult Rufous-breasted Wrens are 14cm long and weigh 16g. They have grey-brown upperparts and black bars on the tail. The throat and face sides are speckled black and white. 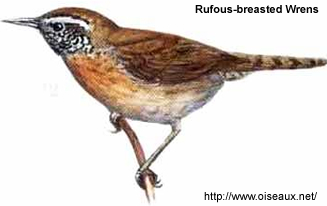 The breast is rufous, the belly is brownish white and the flanks brown. They have a faint line over the eye and a short thin bill. The face pattern and rufous breast are the best distinctions from the similarly sized House Wren. The subspecies found on Tobago, T.r. tobagensis is larger and has darker underparts than the nominate T.r. rutilus of Trinidad and northern Venezuela. There are five other mainland forms. The breeding habitat is forest undergrowth and thickets. The nest is a large sphere of leaves and grass with a side entrance, concealed in tangled vegetation. The female incubates the clutch of two to four brown-blotched white eggs, and the naked young take 16 days to fledge. Rufous-breasted Wren’s song is a musical whistle of six to ten notes, too-see-HEEear-too-see, too-see-HEEear-too-see . The contact call is a sharp cheep, given as these skulking birds forage in vegetation for insects and centipedes.